• By strengthening the blood vessels and enhancing the capillary condition, OPCs help maintain and improve blood circulation in the brain. • OPCs check free radicals and thereby inhibit their detrimental influence on the condition of collagen. 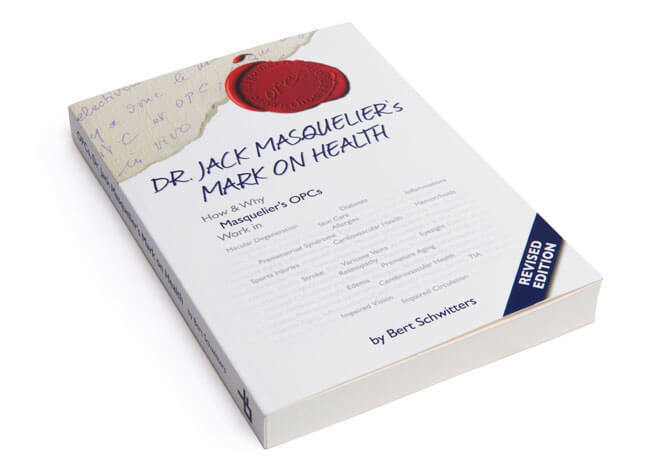 Moreover, as we will see later in this book, free radicals help create the bad type of cholesterol, which in turn has a negative influence on vascular and cardiovascular health. Free radicals not only attack the vascular wall, they also directly attack the gray matter. With age, they may cause a diminution of brain signals because free radicals “thin out” the brain’s circuits. People suffering from diabetes, disturbed fat metabolism, or high blood pressure and people who smoke, drink too much, or take illegal drugs are at risk. Antioxidants have been found to positively influence brain health, which means that people whose diets are relatively deficient in antioxidants should consider themselves to be at risk. In case of a stroke, the lack of oxygen (ischemia) at the site of the stroke leads to permanent damage, especially because in the aftermath of the stroke, the free radicals increase the damage. A stroke causes permanent damage and can cause paralysis, dementia, blindness, or other serious brain disorders. Improving healthy blood circulation comes to mind as a key protective factor. After all, the role of OPCs in improving and maintaining peripheral circulation is well established. OPCs are the “vitamins” of the vascular system. They play a key role in nourishing the brain and carrying away waste materials. Do OPCs have a direct positive effect in senile dementia? In Masquelier’s American antioxidant patent, he claimed a positive effect of OPCs in cases of cerebral involution troubles in aged people (U.S. Patent No. 4,698,360). With “involution,” Masquelier meant the progressive degeneration occurring naturally with advancing age. Already in 1985, when he wrote the text of his “’360” patent, he had the vision that in aged people, a lack of oxygen in the brain tissues could cause psychic and somatic problems, which are manifested in particular in cases of Alzheimer’s disease. This lack of oxygen produces free radicals. So does the re-entry of blood after a cerebral incident. This blood re-entry problem, which is technically called reperfusion, also exists after heart surgery when the surgeon reopens the blood flow to the heart. Free radical reperfusion damage is a well-known complication in heart surgery. Free radicals, when they exceed the limits of the normal purifying scavenging enzymes, damage the cellular membrane walls. In the brain, free radicals damage the membranes of the nervous tissue, which leads to degeneration of the brain. Because of their superior scavenging power, OPCs help to prevent the effects of failure or inadequacy of the body’s own scavenging enzymes when they are overwhelmed by free radicals. Obviously, Alzheimer’s disease, its prevention, and the possible cures have been researched in ever-greater depths since Masquelier included this disease in his American antioxidant patent. In 1985, Alzheimer’s lacked the notoriety it has gained in recent years. Alzheimer’s is now known as a disorder caused by various factors. Oxidative stress has been identified to play a major role. Masquelier’s French colleague, Professor Jean-Marc Orgogozo, even assumes a viral origin. In this context, he is conducting worldwide epidemiological examinations related to wine consumption and nutrition. So far, his results indicate that Alzheimer’s disease is rarest in populations where people are used to consuming red wine as part of their daily food. Let’s wait and see. At this point, there is sufficient reason to justify the preliminary conclusion that the antioxidative effect of OPCs so abundantly present in red wine might be one of the keys to solving the problem of Alzheimer’s.